Cold Dude Computers: Community Blog: January 2013 Penguin Style Sneak Peek! Community Blog: January 2013 Penguin Style Sneak Peek! Recently Polo Field released a new post on the English Community Blog about the new Penguin Style being released tonight! The full post is below. Ready to get the New Year started with style? The new Penguin Style catalog comes out later this week. Check out the cover! You read that right… The new catalog will include a page of clothing items everyone can buy. Very cool! Also, we had to move our weekly launch to tomorrow evening, Thursday, January 3. So that's an extra day to keep earning coins for the new items in the catalog! Now non-members can finally put some clothes on their penguin! Exiting! 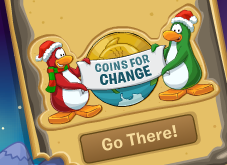 If you notice on the catalogue, the penguin looks a little "cartoonish", then also take note that the two coins for change penguins on the map look " cartoonish" as well! Do you think that Club Penguin are going for a cartoon look this year? Leave a comment and let me know!